Well, as sometimes happens on blogs I have been absent for too long, however I have been drawing daily and making books and feel that I have had a very productive month. I am a member of the St. Albert Paper Arts Guild, which is a group of practicing master and intermediate level Paper and Book artists. We meet regularly throughout the year for weekend workshops and we have a two week workshop in August. I started working on some handmade books during our March weekend, continued working on them during our April get together and I have just finished them today. 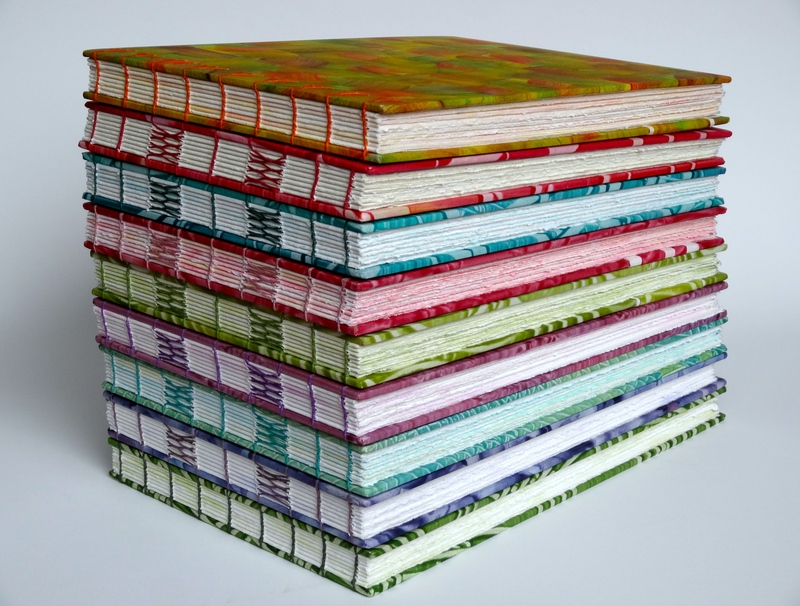 I love piles of books, especially piles of hand made ones. 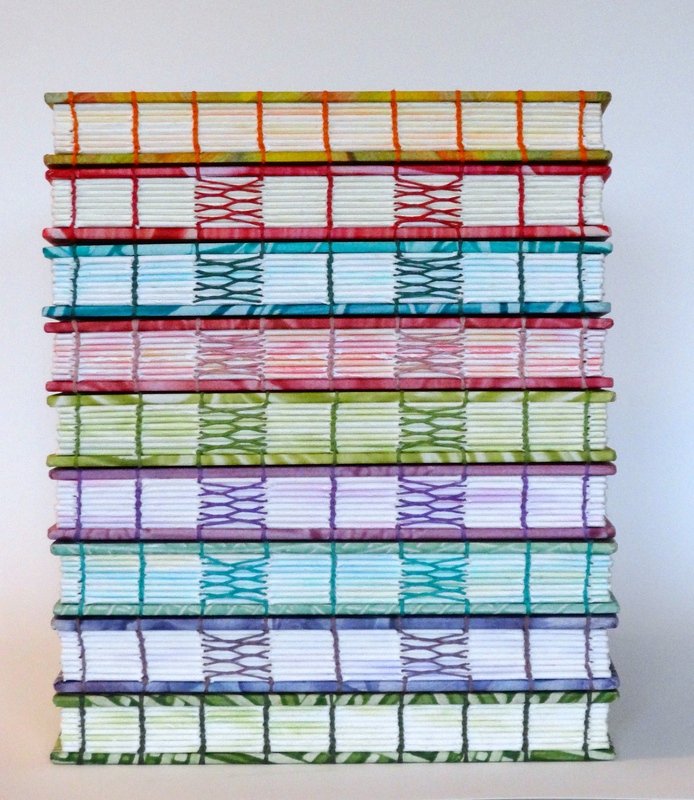 These journals are 7 1/4” x10 3/4” and the covers are made with my paste papers. We had a fun weekend in February making paste paper and paste book cloth, so I had a nice stash to choose from. The pages are Stonehenge 100% rag paper which I painted painted to coordinate with the book covers. 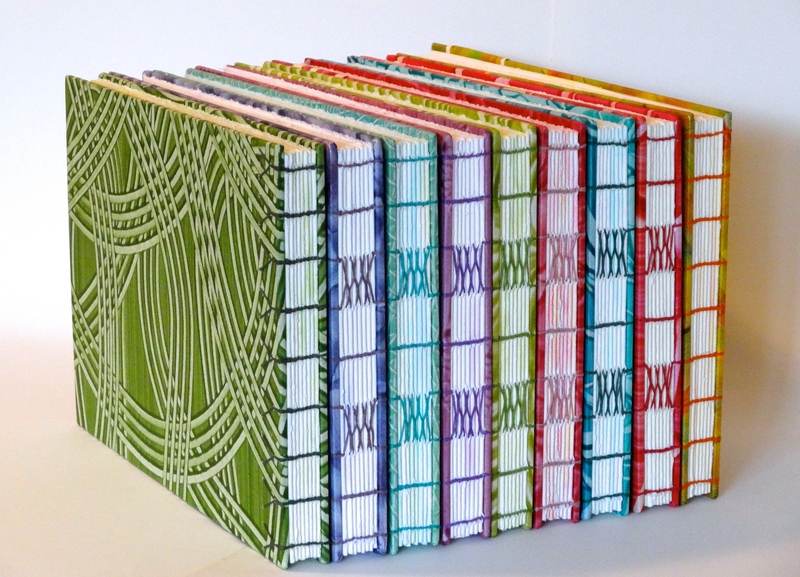 I intended to bind them all the same, but as you can see, forgot to do the interlocking stitches on two of the books. Not sure how I managed that but I didn’t notice until I had almost finished the binding so left those two as Coptic Binding with no extras. These books will be for sale in WARES, which is the shop in our City Hall that has work for sale from all the St. Albert Guilds: Paper Arts, Painters, Potters, Floral Arts and Quilters Guilds. I am very fortunate to live in a city that promotes and supports both the Visual Arts and the Performing Arts. They look so pretty I wish they were staying on my bookshelf. I guess I need to make some more for myself. This entry was posted in Handmade Books, Paper Arts and tagged Coptic Binding, Handmade Books, St.Albert Paper Arts Guild by Trudy. Bookmark the permalink. Thanks Lynn, I was happy with the way they turned out. Thanks Shannon,They are in WARES now. I dropped them off this afternoon.